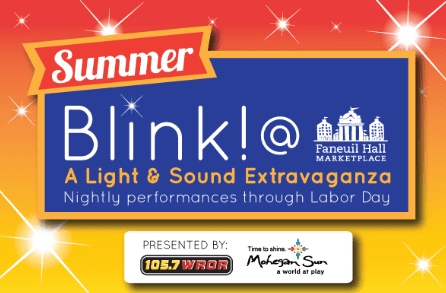 A Light & Sound Extravaganza is making a summer appearance which launches tonight, July 15th at Faneuil Hall Marketplace! Performances will illuminate Boston’s skyline nightly starting at 8pm now through Labor Day. Also, a few restaurants and retailers at Faneuil Hall are offering a few specials like a free ice cream topping, free blink! ring, and more to celebrate Blink! To see all discounts and deals at Faneuil Hall for Blink! please visit here.